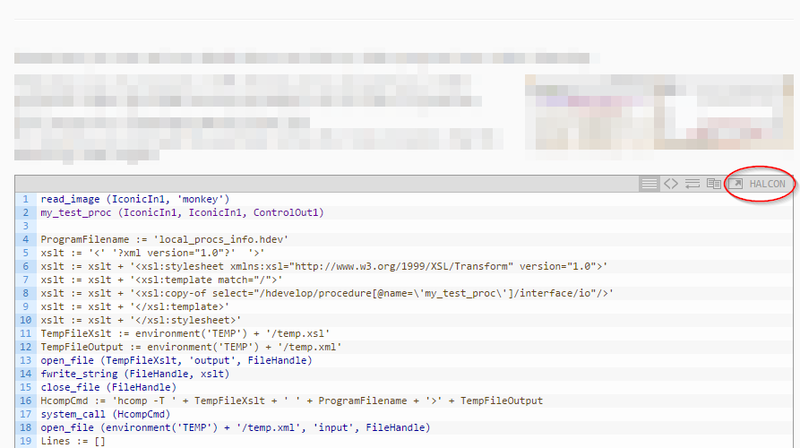 If you want to post HDevelop code to your Wordpress site, I recommend using Crayon Syntax Highlighter. It can be customized to display the HDevelop/HALCON programming language quiet correctly. Install the plugin Crayon Syntax Highlighter via Plugins / Add new in your Wordpress Dashboard. Unzip the attached language description file wordpress-crayon-langs.zip into the langs/ directory. Unzip the attached theme description file wordpress-crayon-themes.zip into the themes/ directory. Create a new post. In Wordpress' TinyMCE editor (Text mode) you should see button labeled crayon. Press this to insert a HDevelop code snippet. Make sure to select the language HALCON and the theme HDevelop.